Something that rarely happens in California could result from Gov. Brown’s proposal to contain growing state worker retiree health care costs — benefits received by current government retirees might be reduced. Part of the governor’s proposal allows state workers to choose a new low-cost health plan, increasing take-home pay. If enough choose the new option, the average cost of four health plans used to set retiree health care insurance payments would be lowered. How many would choose the option is unknown. But the low-cost plan may have the potential to soon slow some of the rapid growth in health care costs, unlike other parts of the proposal that have delayed impact and require bargaining with labor unions. 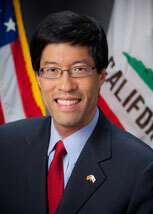 Last week at a Senate and Assembly public retirement committee orientation, the new Senate chairman, Richard Pan, D-Sacramento, told a Brown administration official his committee will hold a hearing on the low-cost health plan proposal. He did not mention “vested rights,” which under California court decisions protects public pensions from cuts. It’s been the central issue in attempts by local governments to cut retiree health care benefits in recent years. Pan, a pediatrician and former chairman of the Assembly health committee, said “there are some policy concerns” about whether the low-cost options ensures state workers have access to adequate health care when they retire. “I realize it’s voluntary but, having been a former health committee chair, voluntary still has certain implications on choices people make, and so forth, and how that can impact other employees,” Pan said. The senator said his committee hearing on the low-cost health plan would be separate from budget committee action on the plan. Some past decisions on key budget issues have emerged from leadership meetings. Odd as it may seem, the health care subsidy state workers receive when retired, often 100 percent of the insurance premium, is more generous than the subsidy on the job, usually 80 to 85 percent of the premium, depending on labor bargaining. 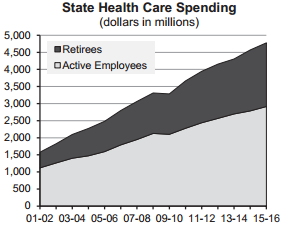 Active state workers once had the same full health care subsidy as retirees. Then in a state budget crunch in the early 1990s, the state saved money when workers agreed in labor contract bargaining to pick up some of the health care cost. There is no labor bargaining for retirees. So retirees continue to receive the average payment of the four health plans with the largest state worker enrollment, which can cover 100 percent of the premium for retirees and 90 percent for their dependents. The new state budget the governor proposed in January would give active state workers the option of choosing a low-cost health plan with a high “deductible” that must be paid out of pocket before insurance covers expenses. To help workers who choose the low-cost plan pay deductible costs, the state would contribute to a tax-deferred “Health Savings Account,” a 401(k)-style individual investment plan. “The current ‘platinum’ level of health coverage leaves the state — and employees — vulnerable to to the pending Cadillac Tax,” the governor’s proposed state budget said in January. After a pension reform in 2012 and a phased-in $5 billion annual rate increase last year for the underfunded California State Teachers Retirement System, Brown’s new budget plan would pay down a huge debt for retiree health care promised state workers. The state worker retiree health care debt or “unfunded liability” is estimated to be $72 billion over the next 30 years. That’s more than the unfunded liability CalPERS reported for state worker pensions last year, $50 billion. If nothing is done to contain the rapidly growing cost, the state worker retiree health care debt is expected to reach $90 billion in the next five years. The state will spend an estimated $1.9 billion on retiree health care next year, four times as much as $458 million spent in 2001. Retiree health care will be 1.6 percent of the general fund, up from 0.6 percent 15 years ago. Brown’s plan would save the state money in the future by switching from “pay-as-you-go” funding, which only pays the health insurance premiums each year, to pension-like “prefunding” that invests additional money to earn interest. The budget calls for bargaining a 50-50 split between employers and employees of the retiree health care “normal” cost, the actuarially determined value of retiree health care earned by workers during a year. For current state workers, prefunding would be a bite from their paycheck. The state estimates that its half of the retiree health care normal cost will be $600 million a year when prefunding is fully phased in. “The proposal to eliminate the unfunded liability, by the state and our employees sharing in the cost of prefunding those benefits, is generally a matter of bargaining, and those will be pursued at the bargaining table,” Richard Gillihan, Brown’s Human Resources director, told the two committees last week. Some state workers have begun prefunding retiree health care. The Highway Patrol contributes 3.9 percent of pay with a state match of 2 percent of pay. Two other small bargaining units contribute 0.5 percent of pay with no state match. For the state, prefunding would be spending to save. Costs go up for years before investment earnings begin reducing annual expenses. The California Public Employees Retirement System, for example, expects investments to cover two-thirds of its pensions. For new hires, in addition to sharing the normal cost the budget calls for bargaining longer service to become eligible for retiree health care and limiting state premium payments to the amount received while on the job. Ten years of service is needed for state workers to be eligible for retiree health care, beginning at 50 percent coverage and increasing to 100 percent after 20 years. The proposed budget pushes back the thresholds to 15 and 25 years. For current retirees, the low-cost health plan could indirectly be their contribution to containing state costs, if the number of state workers choosing the option is large enough to lower the four-plan average that sets their premium payment. The low-cost health plan apparently would not be bargained. Legislation would direct CalPERS to begin offering the option among the health plans from which state workers can choose. The low-cost health plan is similar to Brown’s proposal for a “hybrid” pension, combining a smaller pension with a 401(k)-style plan. It was rejected by the Legislature in 2012 when most of the governor’s 12-point pension reform was approved. This entry was posted on March 9, 2015 at 7:43 am and is filed under Brown, Retiree health. You can follow any responses to this entry through the RSS 2.0 feed. You can skip to the end and leave a response. Pinging is currently not allowed. Current workers should not be able to “vote” on benefits for retirees who can’t vote. I can’t resist noting my earlier postingon his topic in which I recounted and linked to my testimony in 2007 to the effect that we needed to look at addressing these costs with a three point plan, one of which is cost control. As I stated then and as Brown’s proposal acknowledges now, the way to do cost control for retiree health care is by doing it for active employees. So, here we go. Funny how a Democrat can propose something and get a way with it while a Republican would be castigated as anti-worker, anti-retiree, heck anti-human! America has the best health care in the world for hose who do not pay for it. For those who do pay for it, it is one of the worst. What Cadillac plans? The 40% excise tax would begin in 2018 for individual plans over $10,200 a year or family plans over $27,500. Doesn’t apply to any state plans I’m aware of, although some local government safety workers may be affected. Here in California it has been more important to provide free or subsidized healthcare for illegal aliens than its own citizens (see recent articles of Governor Brown begging “unaccompanied minors” to be sent to California). The money has to grow on trees, or taxpaying Citizens have to pay for it somehow. The story fails to note that almost all state retirees are required to enroll in Medicare Parts A,B, & D or equivalent Medicare Advantage plans when they reach age 65. This significantly lowers the cost of retiree healthcare to the state. I’d be willing to bet the courts will say the retiree 100% health benefit is vested, especially if the working employees get a state-funded 401(k)-style health account but the retirees do not. The state would have to give the retirees a similar health account contribution as a “something of equal value” compensation to offset a cut in a vested benefit. I am not covered by the State, but I remember reading articles that agree with the points put forth by both Charles and S Douglas. There should be no need on part of the author to stir up worry about things that are not in the mix. This country needs a single payer national health plan, administered by the federal government. This type of health insurance plan would cost far less to administer and would allow people to choose their own doctor. …single payer national health plan…? Retiree health is determined by the union contract. Oftentimes, the current voting union members approve a contract for a current wage increase at the expense of the retiree health employer payment being adjusted downward accordingly. Remember the OC Sheriffs.